(a) who has acquired the qualification or Bachelor of Education from any NCTE recognized institution shall be considered for appointment as a teacher in classes I to V provided the person so appointed as a teacher shall mandatorily undergo a six month Bridge Course in Elementary Education recognized by the NCTE, within two year of such appointment as primary teacher. Declaration of Results on or before: Within 06 (Six) weeks from the date of conduct of the examination. Material to be brought on the day of examination: Downloaded Admit Card and valid ID Proof (any of the following) documents such as PAN Card, Aadhaar Card, Passport, Ration Card, Voter ID Card, Driving Licence and Pen etc. Click the FACEBOOK ICON below To get Alerts of All Job Notifications from WAY2TNPSC Interested and Eligible Candidates can apply before 05-Mar-19. Keep on reading this page to know all the above details. So, it will be helpful to know the procedure and details for the candidates who wish to apply for this particular vacancies. 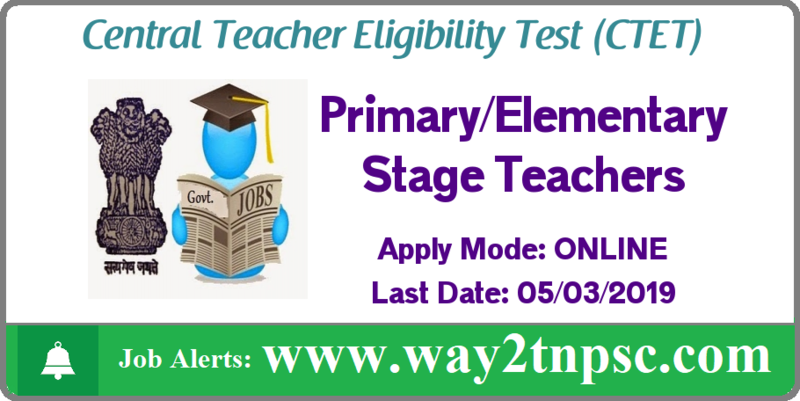 The above Notification ( Central Teacher Eligibility Test (CTET) 2019 | Apply online ) briefly describes about the details of latest announcement or notification includes important dates like release date , last date of application submission, details regarding fees, exam timings. Candidates, check all the needs and apply accordingly.